3. My vehicle was impounded. How do I get it back? 4. My pet was impounded. What do I do? 5. Where can I check for recovered stolen property? 6. How can I find out if a vehicle is stolen? 7. When is the next public auction? 8. I think I have been treated unfairly by a member of the Police Service. What can I do? 9. I think a member of the Police Service deserves credit for exemplary conduct. Who can I contact? 10. I would like to contract an off duty police officer to perform security at an event. How do I arrange that and what is the cost? 11. I think I received a CRA scam email/phone call. What should I do? a. Parking tags (small white ticket left on your windshield) are payable at City Hall located at 580 First Street SE. b. Parking ticket ( long yellow form - received in the mail ) Payable at any provincial court house in the province of Alberta during their normal office hours. Front counter services are available Monday to Friday, 8 am to 5 pm, closed all statutory holidays. Payment types accepted are cash, and interac debit. We also have an ATM machine available. The Owner must attend to the impound lot listed below with proof of ownership. Vehicle will be released to owner upon payment of any towing and storage fees. 4. My pet was picked up by Bylaw? What do I do? Owners must attend the Alberta Pound And Rescue Centre facility located at 1002 South Railway Street SE, during business hours (Monday to Friday 10 AM to 7 PM or Saturday/Sunday 10 AM to 6 PM). All fees must be paid, and have proper animal licensing in place before release of the animal. Proof of ownership is required, call (403) 487-5671 or visit www.aparc.ca/reclaim for further information. Contact the property management unit of the Medicine Hat Police Service at 403-529-8479. Link to National database for C.P.I.C. (Canadian Police Information Centre) property search, a free online public service. A complaint against the Police Service or a police officer must be made in writing and signed by the person making the complaint. To file a complaint you need to complete a Citizen Complaint Against Police Form. You may do this yourself and submit it to the Office of the Chief or attend to the police station and ask for the Duty Staff Sergeant. Complaints against Police cannot be accepted by email. 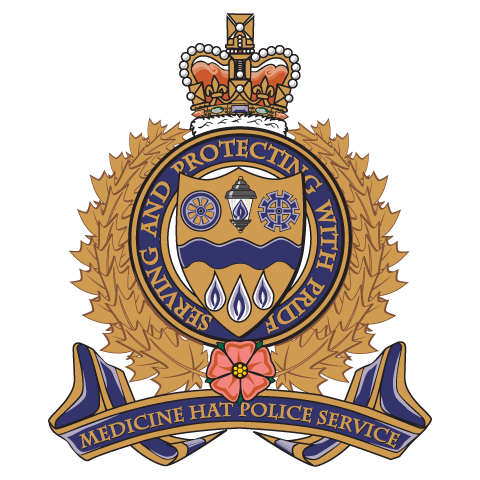 Procedure for Complaints Against Police Brochure: It is important to keep the lines of communication open between the citizens of Medicine Hat and the Police. Citizen Complaints Against Police Form: This form is for the use of persons wishing to register complaints against Police Personnel under The Police Act, 1988. Any push-back from the victim is usually met with immediate threats of calling the police, sending CRA employees to the door, blacklisting a social insurance number, or jail time. The hope is that the caller will be frightened into complying. Often times the scammers request payment of the outstanding debt in the form of gift cards. Threaten you with immediate arrest or prison sentence. Ask for information about your passport, health card, or driver’s licence. Request personal information to be sent by email. Email you a link requesting you fill in an online form with personal or financial details. Send you a link to your refund by email or text message. Setup an in-person meeting in a public place to take a payment. Demand immediate payment by prepaid credit card, iTunes or bitcoin. Notify you by email when new mail is available for you to view in CRA secure portals such as My Account, My Business Account or Represent a Client. Email you a link to a CRA webpage, form, or publication in response if you call the CRA looking for that information. Send you a notice of assessment or re-assessment by mail, or notify you by email when it is available to view in CRA secure portals. Ask for financial information such as the name of your bank and its location. Take legal action to recover the money you owe if you refuse to pay your debt. If you suspect a scam, contact the Canadian Anti-Fraud Centre online at www.antifraudcentre.ca or toll free at 1-888-495-8501. If you believe that you have been the victim of a CRA scam, contact the MHPS at 403-529-8481 or attend the MHPS in person at 884 2nd Street SE to speak to an officer.